Tales of The Brothers Three Vol. 3: The Sock-Sucking Bandit! Vol. 3: The Sock-Sucking Bandit! There have been many noteworthy robberies over the years. But very few, in fact almost none, involve socks. That is until Mook, a sock-loving monster, assembled a crack team of operatives to help him pull off the biggest sock heist in history. 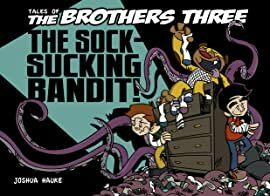 The Sock-Sucking Bandit collects Mook's tale along with several others, including ones about, talking furniture, human snow shovels, Snorasaurus', and cannibalistic basement dwellers. 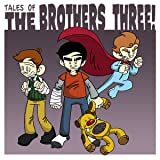 Tales of The Brothers Three chronicles the misadventures of three brothers with overactive imaginations and all the trouble they get into because of it.